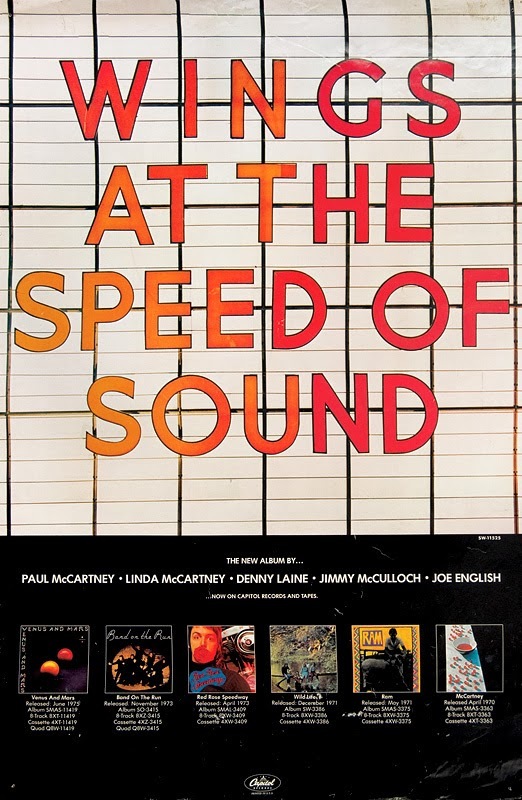 So, it looks like it's Speed of Sound and not Red Rose Speedway after all. And the release date is the day before Paul turns 72. I am really excited for this release in June! 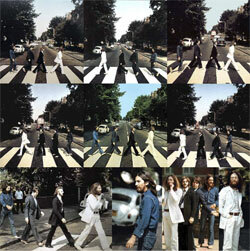 I have been waiting for these remastered albums since 2010 when I saw the coming soon card in "Band on the Run"! The real question is whether Paul will continue the tradition of adding 1974 bonus tracks to Speed Of Sound. Personally, I'm hoping "Walking In The Park With Eloise," "Junior's Farm" and "Sally G" go to Venus And Mars along with both versions of "My Carnival," "Lunch Box And Odd Sox" and "Mardi Gras In New Orleans". That can lead to Speed Of Sound having the 1975 live performances of "Junior's Farm" and "Little Woman Love/C Moon" along with Paul's demo for "Must Do Something About It" and… surprises. 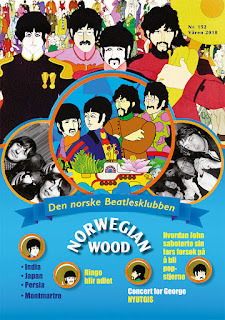 But according WogBlog the month of June is tentative that they plan to launch The Beatles Mono Box Set Vinyl. It makes no sense to launch three highly expensive BoxSet simultaneously. I suppose that any of these releases should be advanced or delayed. I don't think they are worrying about Beatles vs McCartney Archives. The Beatles mono LP collection will have a defined, limited audience and the McCartney Archives have by now found their market, so both these will be pressed in the quantity they are expected to sell. 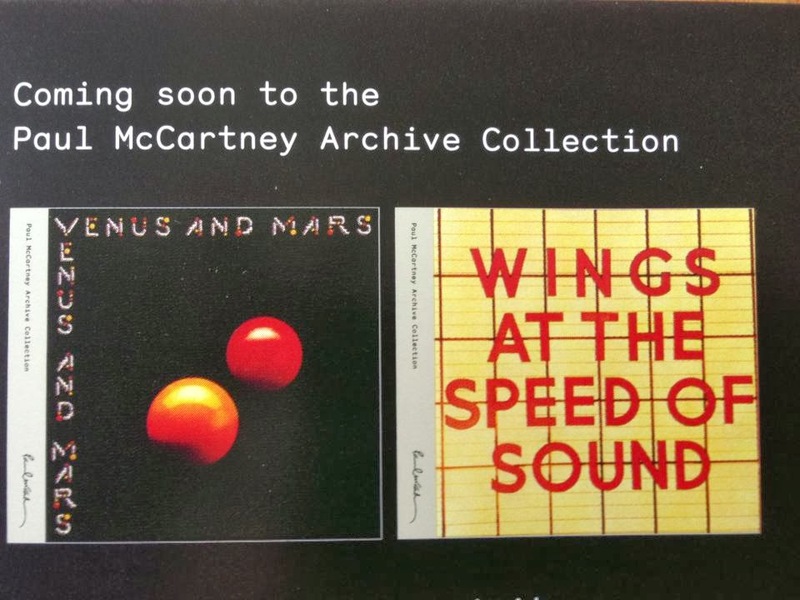 I really do not think both are going to be released in the same month, both products are mainly market to The Beatles fans, and we're not talking about a single CD or DVD, there are three different box set, which I assume will be costly , so do not think it's a good marketing technique. Going back to the fall, we did have Paul McCartney's "NEW" and the 2 Beatles' BBC releases out within a month of each other. Do you know how sales of McCartney Arcives, or specifically deLuxe, are? Although not generally noted and certainly not always wilful, Paul's releases have very regularly coincided with Beatles product ('McCartney'/'Let It Be', anyone? Red Rose Speedway/Red and Blue albums?) and contrary to record company wisdom (whatever THAT is), he's often done rather well from it. Let's face it, you might not be thinking to buy Paul when there's Beatles but how many will add him on impulse when they're in the shop? I know the story of McCartney Album and Let It Be, but now we talk about expensive products and not all fans can afford these box sets simultaneously. If we were talking about a couple of CD's or a DVD, I would say if possible. I think any of these releases will have to be advanced or postponed, a minimum of one month for purely commercial reasons. I think you're overestimating the demand — the vinyl releases are pressings of the CD box set from 2009. And, given Apple's history with vinyl, it's most likely to be delayed. Paul's releases have to come in June so that he can use them to spur interest in his upcoming summer tour. 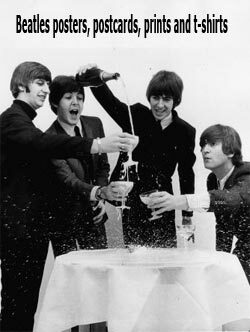 Criterion has announced the re-release of A Hard Days Night for June, as I said it is different if we were talking about a cd or dvd, so this makes more sense because it is a DVD / Blu ray with price of $ 31, compared a vinyl box set that can exceed $ 300. 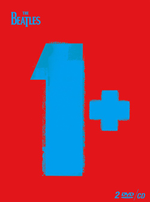 The DVD/Blu ray release of The Beatles together while the Paul McCartney Archive Collections is more understandable andcommercial and economically for both. I think the highlight of Universal and Apple for this year will be The Vinyl Mono Box Set and it must have a exclusive date for this, after all McCartney also takes his part for that big sale. With less than a month to go before the scheduled release date of the V&M and SOS archive reissues, and yet no sign of promotion, my confidence in this happening has dipped to near zero. Has it been put back? I'm starting to think Mr. Brennan made up that date. Wishful thinking on his part? I'm just reading of this 17th June release date for the first time and given that I have not received a "Pre-Order" email from Amazon yet, I don't believe it. Still, I have been looking forward to the Deluxe Edition of both of these and hope that both are in the book format of BOTR, McC, and McCII. It's about a week from the supposed release date and all is quiet. I don't think this will happen at all. It's been over a year(I think) since Wings Over America. I hate to say it, but I think these re-issues are done and finished. As of June 7, Tom Brennan's page now reads "TBD" for these. Let's hope they are coming before Chritmas. Macca's illness and the HDN release probably played a part in the postponement. And don't even mention this is never going to happen... these sets are just the best thing a Macca fan could ask for. I don't see either of these albums/cd's listed on Amazon or elsewhere for release on June 17th. Did the date change? If so, what's the new release date?? Relax. The fact that these haven't been added to the iPad apps of the archive collection suggests to me that they'll be physical first. Scott Rodger's last comment on the archive collection series suggested brisk sales and since the sets will have been prototyped and produced before or since the insert in 'WOA', these are coming. I think that fans are not quite up to the new marketing and sales model Paul and Scott have been pioneering since EMI (and now increasingly adopted by Jeff Jones too). It's a much more flexible and opportunistic model. Things happen fast but they can also be changed fast.